First there was Memories, then there was Friends Day, and now there's Facebook's Birthday Videos. Now that Facebook’s Memories function has taken over the world—at least if my News Feed is any indication—the social giant’s grafting its central concept onto birthdays. 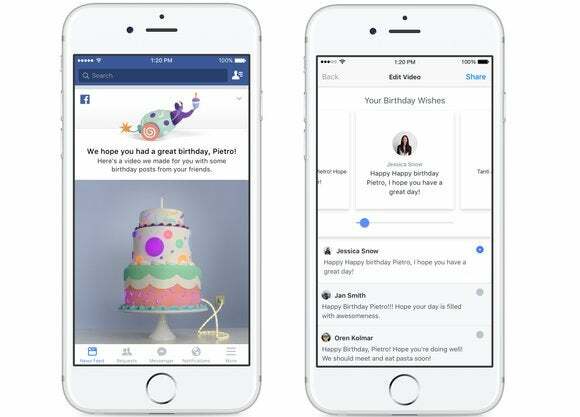 Facebook’s new 45-second “Birthday Videos” will show up in your feed the day after your big day, displaying “a magical birthday cake that lights up and comes to life” before bursting open to show the “top” happy birthday posts and videos sent by your pals. Take note: These videos will only appear if at least three people shoot you a note on your birthday. As with Memories, you’ll have the option to share Birthday Videos with your followers or keep them to yourself. And as with Facebook’s hokey, made-up Friends Day, you can edit which clips and posts actually appear inside your Birthday Video if the algorithms miss something special. The story behind the story: Facebook’s eating the world, one personal connection at a time. The company’s been leaning heavily on aggregation posts with personal meaning in recent years, as evidenced by Memories, personalized Years in Review, Friends Day (ugh), and now Birthday Videos. What’s more, the company recently revamped its News Feed algorithm to focus more on your friends and family and less on brand or business Pages. The relentless return to acting as a central hub for your personal life seems to be paying off for Facebook, which is making money hand over fist by charging those now-neglected Pages to inject advertisements into your feed.